VANCOUVER, British Columbia (AP) — It took 18 games for Winnipeg’s Patrik Laine to finally break loose. After having scored just one even-strength goal heading into Monday’s game, Laine recorded a hat trick and led Winnipeg to a 6-3 win over the Vancouver Canucks. “I’m not going to say it out loud but obviously it’s bothering because you’re not producing five-on-five,” the 20-year-old Laine said. But Vancouver head coach Travis Green said he still saw positives in his team’s performance, especially after going down 4-1 in the second period. Goldobin sent a behind-the-back pass to defenseman Ben Hutton, who fed Pettersson. 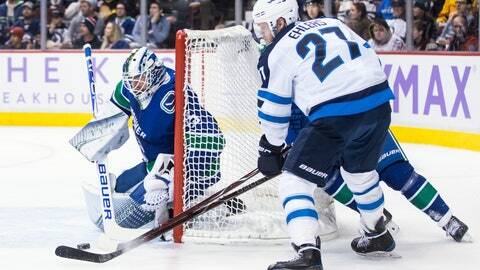 The Canucks’ rookie fired a shot past Hellebuyck, tying the game. Winnipeg added another first-period goal when Connor scored on a power play. Connor’s point streak (four goals, three assists) is at five games.